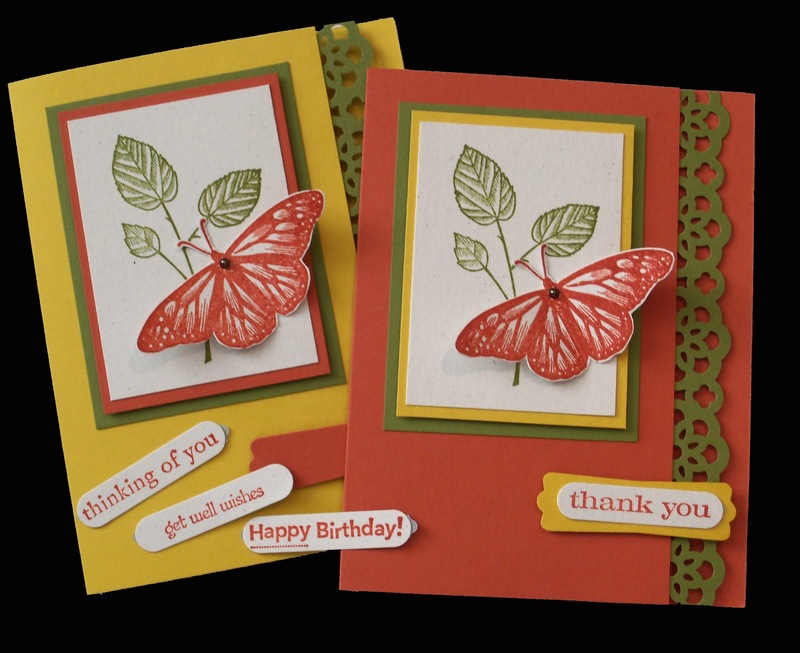 I enjoy making four-piece greeting cards sets along with a matching box. My customers seem to prefer a mix of sentiments. I stamp two each of four or five sentiments and apply a peel away tab. This allows the recipient to choose the perfect sentiment to suit their needs. Check out THIS posting to see more information on how I package the sentiments. 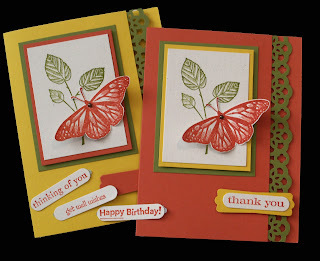 Layer under stamped image measures 2 3/8" x 3 1/4"
Layer measures 2 5/8" x 3 1/2"
Stamped image measures 2 1/8"x 3"
Inside liner measures 3 1/8" x 5 1/4"
Apply adhesive to the inside of the card along the cut edge and attach lace border. Apply adhesive to the 7/8" strip and place over the lace border. 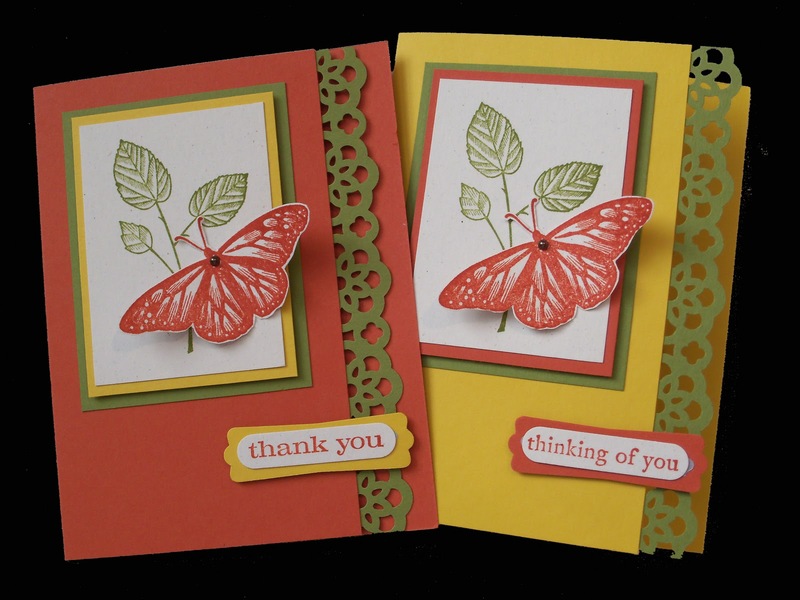 This four-piece greeting card set is available for purchase. I can mail this gift to your friend, relative, co-worker, etc, and will include your personal note. I accept Paypal and I ship within two business days. Please EMAIL me for more information. 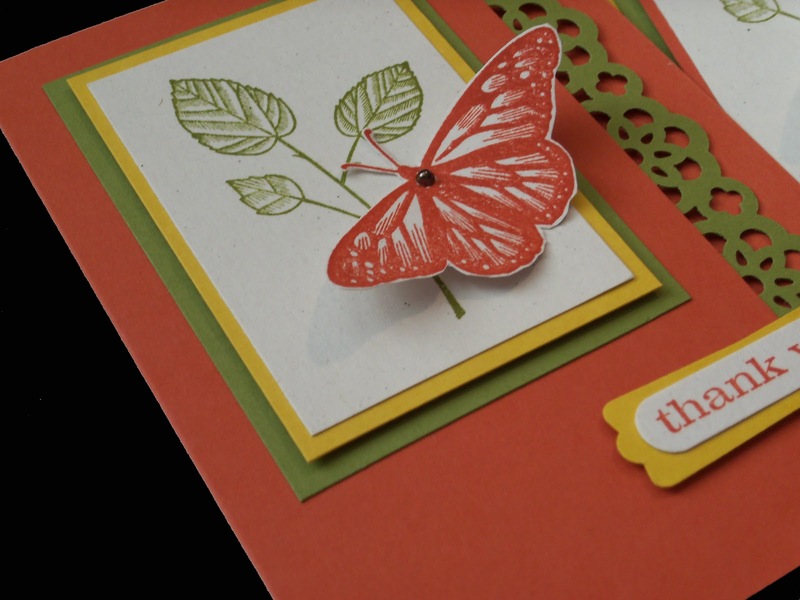 Helpful hint: When using border punches, I like to have it centered when applying it to the card base or card layer. I find that centering the piece of cardstock in the punch and then moving the piece of paper to the right and to the left results in a messy punch. I always start with my paper in the left side of the punch and move it to the right. I first created a template using the Lace Ribbon Border punch; I started out with a 7" piece of cardstock. I lined up my template and centered it to the piece I was going to attached it to. I was then able to see what part of the lace ribbon ended up on the right side of the cardstock. I found the starting point on the punch and applied a label showing me where to begin punching. Perhaps this illustration will show you what a mean. These are gorgeous, Beth! What a great idea on using sticky paper on your labels! Great gifts! Thanks for sharing! I love the colors you used.